Consider it as a sort of Moneyball for the chess set — and it’s also possibly the year’s most soulful movie. It’s about life in the slums of Uganda. It’s about using sport as an avenue to a new life. It’s about facing and overcoming challenges. It’s about thinking strategically. And it’s even rated PG. In short, this is the right movie at the right time, one that deserves a large, all-ages audience. 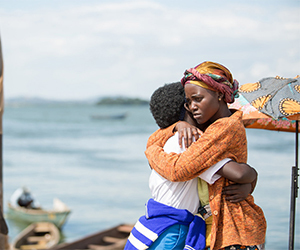 The Queen of Katwe is the kind of movie that offers hope amidst the bleakest of outlooks. Look to this queen for some inspiration. After all, in chess, the small one can become the big one. In this case, the “small one” is Phiona Mutesi (Madina Nalwanga in a most impressive debut). She’s a young girl who should be in school, were It not for the absolute destitution she has to overcome. And don’t forget this: The Queen of Katwe is based on a true story, following Phiona’s life between 2007 and 2012. Phiona’s story is truly one of seizing the day and rising to the top with the most minimal of resources. Phiona, while too poor for the luxuries of things like school, happens upon a group of kids playing chess and their kindly tutor, Robert Katende (David Oyelowo, Selma). He’s studied engineering, but his heart is in building young minds. In the pecking order of things, Phiona is at the bottom of the bottom. The other kids are offended by her body odor. Those same kids, in turn, set their sites on beating the rich kids — the ones studying in a posh school while wearing gold watches and looking down with a bit of disdain at the riff-raff getting in their way on the road to chess championships. But big things have small beginnings and Phiona in fairly short order begins to dominate the chess board. She’s a natural at the game, applying parts of her mind long-ago relegated to thinking about nothing more than pure survival. She can see ahead — planning out eight moves ahead of her competitor with the aptitude of a born champion. Phiona is most definitely living proof of the notion where you’re born shouldn’t dictate whether you live or die. All of the chess action (and no, that’s not an oxymoron) is set against a backdrop of squalor. Phiona’s family is evicted from their shantytown abode. Her injured brother is cared for in a hospital that’s run out of pain medicine. It’s no matter. Their mother, Harriet (Lupita Nyongo’o, 12 Years a Slave), has run out of funds, so she can’t afford the medical bills. Harriet gave birth to Phiona’s sister, Night, at age 16. Night follows suit and becomes pregnant, further straining Harriet’s efforts toward a better life for her family. But, even amidst the challenges at home, Harriet offers Phiona just enough room to pursue this crazy dream of playing chess. Navigating through the family drama and the aspirations of a better life, Phiona learns that challenges are not a curse, they are building blocks. Given the most modest of upbringings, to put it politely, Phiona also has to contend with self-doubt, even after victory. The simple fundamentals of a life well-lived regardless of the environment at hand elegantly play across the screen under the direction of Mira Nair (Monsoon Wedding). Sure, some people seem to get all the breaks. But that oftentimes comes with a price, such as a lack of character — the kind of character forged by loss and perseverance. Losing is a powerful teacher, one that offers insight into how to play better. What matters is that you reset the board and play again. There’s nothing like persistence and hard work and that message never shines more brightly here than when, at the story’s conclusion, the real-life people behind this story stand side-by-side with the exceptional actors who portrayed them.